Some people, such as this one, may possess illegal DNA. Hollywood, CA — The Motion Picture Association of America today announced that they have identified an illegal gene sequence within the DNA of some humans. When converted from Base4 amino acid chains to a Base16 number, the sequence AAGC TTGC ACAC AAAG GCTC CTCA TGAT CCGT TCGA CAAC CCCG TACC CGAT CCCG GAGA TAAA represents a code which can be used to hack the AACS encryption on HD-DVD and Blu-Ray discs, and is thus a violation of the Digital Millennium Copyright Act. The MPAA has begun issuing cease-and-desist orders to known offenders, and plans to implement mandatory DNA testing at all cinemas and video rental stores by the end of the month. Under the DMCA, anyone found in possession of the illegal gene sequence may be subject to fines up to $100,000. Distribution of the code, by sexual reproduction or organ donation, could result in prison sentences of up to 5 years. 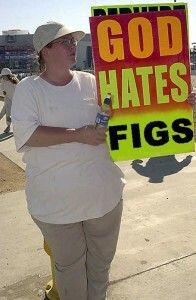 Members of the Westboro Baptist Church spread their message of hatred and bad spelling. 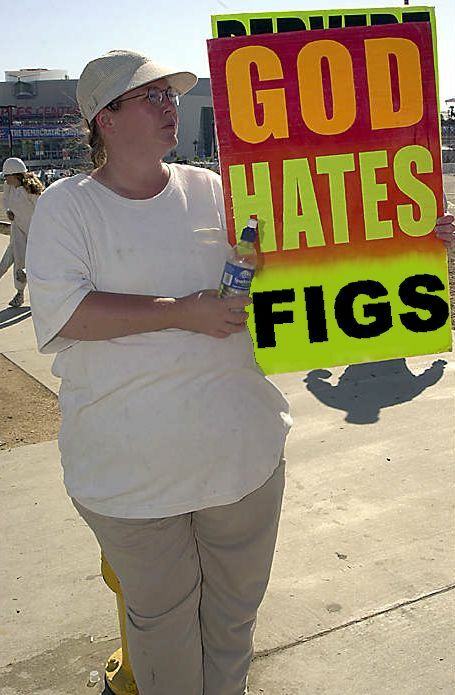 HEAVEN — God (aka “Yahweh”, aka “Jehovah”, aka “Allah”), creator of the Universe and founder of at least three of the world’s major religions, today filed a lawsuit against Fred Phelps and the Westboro Baptist Church for Libel, Slander, and Defamation of Character. The WBC claims, among other things, that God hates homosexuals, hates America, kills US soldiers, and sends destructive weather such as Hurricane Katrina to punish us for our sins. Upon hearing the initial evidence, the judge issued a Temporary Injunction, ordering the WBC to immediately Cease and Desist distributing or otherwise displaying any signs, banners or pamphlets which claim to know the Will of God, and to remove all references to God from their web site and other literature, until the case is resolved. 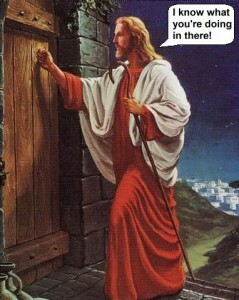 Jesus Christ: Messiah or Stalker? LOUDONVILLE, GA — American high school student Brett Samhause today filed a restraining order against Jesus of Nazareth, aka Jesus “the Christ”, claiming that the former carpenter and founder of the Christian Church unlawfully spied on him and invaded his privacy. Similar charges were made against Father Christmas in 1996, leading to lawsuits in 34 countries, including People v. Kringle, in which the US Supreme Court awarded a staggering one billion US dollars (approximately £540 million GBP) in damages. Kringle, who (like Jesus) has numerous aliases, is believed to currently be hiding somewhere in the Arctic Circle. The presence of Samhause’s attorney has fueled speculation that he may be preparing to file a civil suit against the Son of God. 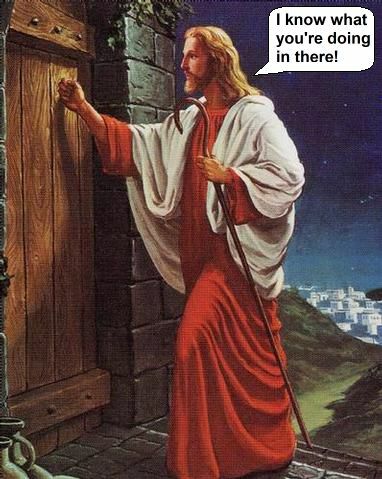 As the only known heir to Jehovah’s vast fortune, rumoured to include the entire Universe, Jesus’ net worth may be infinite, which His followers say makes him an obvious target for frivolous lawsuits. When asked about the possibility of litigation, Samhause’s lawyer declined to comment. Under the terms of the order, Jesus must maintain a distance of at least 100 yards (91 metres) from Brett Samhause at all times, and is not allowed to contact him in any way. “I just want my life back,” Samhause said in conclusion. If he violates the order, Jesus could be subject to fines of up to US$10,000 (about £5400 GPB) or 1 year in prison. Last known photograph of Jimmy Hoffa, before he vanished mysteriously. Detailed analyses of this image have failed to offer any clues regarding his disappearance. DETROIT (Reuters) The FBI is seeking the assistance of the CBS drama Cold Case in locating the body of missing Teamster boss Jimmy Hoffa, sources within the agency reported Wednesday. Just days after calling off an unsuccessful search of the Hidden Dreams Farm, the FBI has reportedly dispatched agents to the offices of the Columbia Broadcasting System in New York, in the hopes that the detectives of their hit show Cold Case might have better luck solving the 31-year-old missing-persons case. Although the series is currently on hiatus for the summer, agency sources reveal that the FBI is optimistic that it will see a break in the case, once episodes resume this fall. Responding to criticism over its decision to involve the fictional Philly police department in the search for Hoffa’s body, the FBI insists that existing episodes of Cold Case clearly justify the move, and encourages critics to check out previous seasons, which are now available on DVD. When asked if he realises that Cold Case isn’t real, Special Agent Hunt punched the reporter in the nose and ran away. CBS could not be reached for comment. But… who’ll look out for poor BP? When all else fails, redefine!